Apple cider vinegar is a natural remedy that can be used to relieve the suffering caused by acid reflux and heartburn, two very widespread afflictions that usually require prescription medication to treat. Many minerals such as phosphorous, chlorine, sodium, sulfur, potassium, calcium, copper, iron, and fluorine can be found in apple cider vinegar, and they are partly the explanation how the vinegar combats bacteria, and what makes it such a positive treatment for acid reflux. While it might appear illogical that a substance such as apple cider vinegar can help treat acid reflux, the apple cider vinegar helps treating both acid reflux and heartburn more effectively than some antacid medicaments. The vinegar acidity actually helps alleviate the burning and nausea caused by acid reflux. Besides this, apple cider vinegar assists the stomach in digesting by mimicking the level of acid in the stomach. Problems can sometimes be caused by the lack of stomach acids, in which case traditional antacid medication actually makes matters worse. The best method of use for apple cider vinegar for acid reflux control involves either making the vinegar or purchasing it in raw form. Natural apple cider vinegar is created from organically grown apples, which have been aged and crushed into cider. Its appearance is that of a brownish yellow liquid, and the healthy properties are all contained within a stringy glob that floats in the liquid, and is known as the ’’mother of vinegar’’. The most effective way of taking apple cider vinegar is in the liquid form that possesses the ’’mother’’ enzyme, and therefore it is recommended shaking the bottle before ingesting, so that the mother mixes well with the liquid. 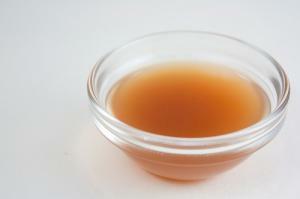 The method of ingestion involves taking a tablespoon of vinegar before every meal. To remove the unpleasant taste, options include mixing the liquid with sugar, or mixing it with salad dressing or hot water. Apple cider vinegar is also available in tablet and capsule form, though the liquid form is deemed more effective. In the case of an upset stomach, reducing the number of tablespoons taken is allowed. Results come within a few days of following the mentioned regime. The negative side effects of apple cider vinegar include an upset stomach, worsening heartburn and a thinning of the blood, but these cases are mild and rare. If any blood thinners are also taken in the same time as apple cider vinegar, it is advised to cease taking the vinegar immediately. Any persons wishing to consume apple cider vinegar for reflux treatment are suggested to first check with their doctor. It is also important to note that natural treatment such as apple cider vinegar should not replace any prescribed medication without specific instruction by a doctor. Do Natural Toenail Fungus Treatments Really Work? Does Apple Cider Vinegar Have An Effect On Weight Loss? Are Aunt Idas Apple Cider capsules any good? Can Vinegar cure Acid Reflux? Apple Cider Vinegar Effect on Face? Acid reflux or somthing else? Can you lose extra weight when taking baking soda and apple cider vinegar?